The basic survival course is designed to teach you the skills you need to survive for the first few weeks of a survival situation. You will learn how to make a shelter that will keep you warm and dry, methods of fire-by-friction, water purification with primitive containers, make primitive traps and learn primitive hunting techniques. After this course you will have the knowledge to keep you and your loved ones alive in nearly any wilderness situation. This class takes the student way beyond the bow-drill taught in the basic class. This course is designed to give the students the ability to make a fire in mountains, jungles and deserts. We'll focus on all primitive fire (no knife, no rope) and I'll teach you, step by step, dozens of tricks that will allow you to consistently get natural cordage fires, hand drill, bamboo fire-saw, rattan fire-thong, fire plow and pump-drill. By the end of the day students will be making fires straight off materials on the landscape. Learn to make your own willow basket. Instruction and supplies included. Learn various weaving techniques of 'stake and strand', 'twining' and the 'French Rand'. Each student will weave a small or medium sized basket. In this course we will create hunting bows out of a single piece of wood. The bow-stave wood will be Osage Orange tree--the most prized and effective wood for bow-making. Come spend 3 days making a bow that will take down any animal on this continent. Learn to make the most beautiful, soft, warm and strong leather by using the totally natural method of brain tanning. Use this leather to make shirts, skirts, bags, moccasins...the potential is limitless. Availability of classes dependent on availability of materials. The Art of Flintknapping Flintknapping is the creation of stone points, arrowheads, spears and knives from Flints, Cherts and Obsidian. In this course we will go through all the stages of arrowhead and spear creation with a ton of hands-on guidance. Each student will leave with a handful of arrowheads and one completed hunting arrow. 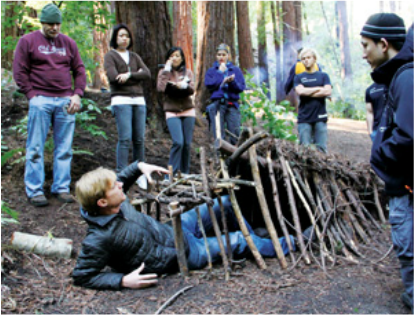 Get started with a super fun and active introduction to survival living. Skills taught in this day long course introduce your children to the knowledge of how to stay alive during the first few weeks of a survival situation. Children will create shelters that will keep them warm and dry in most environments, make friction-fire by 'rubbing two sticks together', purify water with hot rocks, learn safe edible plants, create cooking vessels, traps, practice primitive hunting with the Atl-Atl spear-thrower learn how to stalk through the woods silently with fun and challenging awareness games. Make your own basket out of the bark of a Tulip Poplar tree. These baskets are incredibly sturdy and look as amazing as they are unique--also probably the fastest basket you can make in survival. Come spend a day peeling bark and shaping it into one of numerous styles of baskets. Primitive bark bowls and canteens will also be demonstrated. This course is only run in the Northeast USA during May or June. Imagine harvesting your own coconuts on the beach, roasting them on a fire you made from rubbing bamboo together, relaxing under the stars while listening to the ocean in your handmade shelter from palm fronds and grasses. Come spend a week with us as we have a true adventure. The first few days will be spent catching you up to speed teaching you shelter, numerous friction fire techniques, traps, water purification, spear fishing and edible/medicinal plants of the islands. Then we take off for 4 days, testing our selves, and our skills, in paradise. 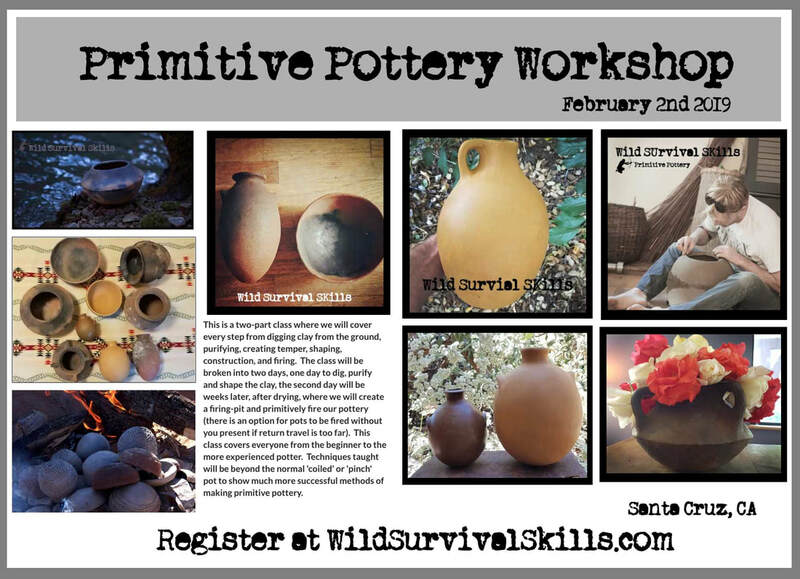 Dig natural clay from the ground, learn various purification methods, building techniques from around the world, test a myriad of natural tempers, and fire pots in a primitive fire pit. Even if you have made pottery before, this class will increase your success rate immensely. During this 2-day course we'll spend our days exploring the landscape in search of wild edible/medicinal plants (while learning about & avoiding toxic species), natural cordage materials, fire making supplies, animal/game trails, shelter materials, and more. Nights will be spent relaxing around the campfire, weaving rope, processing plant materials, carving traps, and burning wooden bowls. While this is an introductory class, it aims to give participants a comprehensive look at the foundational steps taken in the first few weeks of a survival situation.